This month, after three years of promising my daughter that I would up-cycle her chest of drawers (a bargain £40 from the charity shop - 100% wood, no veneer here and beautiful dove tail joints, without wanting to sound like my Grandma, they don't make them like they used to!) I finally got round to painting them. Her new bedroom, purple wallpaper adorned with feathers and grey carpet were the inspiration...so out came the DecoArt Yesteryear Chalky Finish, Americana's in purples and greens, my trusty Vintage Rose kit and silver for a few feathers. I'll be honest, I never painted a feather in my life but in for a penny, in for a pound I went for it. Worst case scenario? I'd sand and repaint it. I shared a few photos on social media and wow! Who'd have thought you'd all fall in love with feathers like you did. You requested a tutorial and so I sat down last night and thought, how on earth did I do it.... 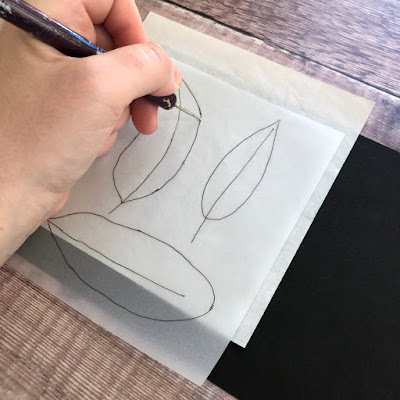 Here are the steps I went through though I will say, if you have not begun your journey with the liner brush yet, this is a great project to try, it is easier than it looks and it is very forgiving. I have drawn out a few feather outlines for you to download here. When you are practicing, I would suggest working with a smaller version first just to get the feel of painting them. Practice paper*- I love working on black, especially for this project. Dotting tool* (or something similar) to transfer the design. Step 1: Once you have transferred your feather onto the practice paper, using your liner brush, paint your centre line from the bottom of the feather to near the top. Tip: you may need to add a little water to your paint or Drying Time extender to help the brushstroke flow, especially if you are working on a larger feather. 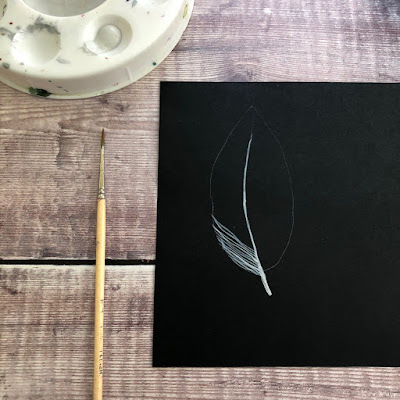 Step 2: To paint the strands of the feather, roll the paintbrush in the paint (as Carol teaches in her video here) to remove the excess before painting. Although this is a very forgiving design, you want to avoid blobs of paint near the centre. Step 3: Start painting your strands working from the centre line to the outside. Don't try to be too straight, don't think too much...the wobblier the better sometimes! As you can see, some lines are 'brighter' than others and that's ok too. It will all add to the finished look. Tip: Don't be tempted to flick the brush when you are doing this. Just like when painting Folk Art, always pull the brush and lift near the end of the brush stroke. Step 4: Continue working down one side of the feather. As you paint, try to change the 'wobble' in your brush strokes. This will give you gaps in the feather like a real one. Step 5: Repeat the process down the other side. Step 6: Now you have done the first layer, it is time to build it up. For this I used a dryer brush meaning I did not add water to my paint and I kept painting brushstrokes even when there wasn't much paint on my brush. Here is what my brushstrokes would have looked like without the finer ones underneath. You can see they are much less thought out but just add texture to the final feather. Here is the finished feather. 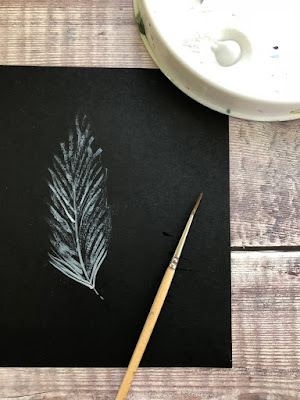 Note: As you get more confident painting feathers, you may find that instead of painting two layers, the finer brushstrokes and dryer ones will come naturally to you as you paint, that's fine, the effect will be the same. Like we always say at Folk It, it will all come with practice. Once you have mastered the feather, have fun and play with ideas. Here, I drew round a bowl, following the circle with each centre line and filled in both sides of each feather. There is so much you can learn using the same brushes and techniques taught in our kits, if there is something you want to try, go for it and if you aren't sure, get in touch or attend one of our workshops, we are always happy to help. I do hope you enjoy this tutorial, if you have any questions or have a go yourself, please leave a comment, we'd love to hear from you. When I was learning to paint and teaching, one thing I loved was combining different elements to create something different. Whether you have learned daisies, roses, ribbons or all three, there are numerous ways you can combine them to create something unique. There were always some elements for me though that pair so well together, I found myself pairing roses and delicate lace time and time again in different ways. This month, for our theme in April we are focusing on pattern and I just couldn't help but look through a few of my old pattern folders and came across this design. Mixing vintage roses, flat brush leaves and lace, it creates a delicate pattern that I will be working with throughout the month. So join me as I play with colour and play with this design to show you how you can create many different looks with just one design. If you would like to have a go at painting this design and want to join in and discover all the different looks you can create throughout the month, you can download the design from our Pinterest Folk It pattern board. Although we haven't had a bad winter in the UK this year, that doesn't mean we haven't welcomed the first signs of Spring. Each year around this time, we get asked to paint some Spring flowers and designs inspired by the beauty and colour of this time of year. Last year, we created the beautiful Herb box tutorial which were loved by so many of you. For March's Spring theme this year, we decided to mix a few old favourites with some new ideas and incorporate some decorative painting skills with round brush AND flat brush strokes. Before you follow the video tutorial, you will need to transfer the pot pattern onto your surface, we used our A4 Mount board for practicing. Now to fill your pots! Again, before you begin, transfer the leaves, circles and comma strokes as shown on the pattern. Vanessa created this beautiful day pot following our tutorial. Colour inspiration: Why not try painting them in different colours by substituting the Antique Rose for reds or blues? If you have learnt to paint the comma stroke, you can also paint these beautiful violets. Some of you may remember our popular violet tutorial - if you need a bit of extra guidance when painting this pattern, feel free to refer to that. Teresa just went for it and completed all three - don't they look fantastic! We do hope you will have a go and have #funwithfolkit this Spring! Just as Sheffield is known for it's steel, The Full Monty and Hendersons Relish, Russia is known for its Matryoshka (or Babushka) dolls. Beautifully decorated in handpainted Russian Folk Art designs they are often painted as Russian Peasants but may also be painted to depict fairytale characters and people of importance. 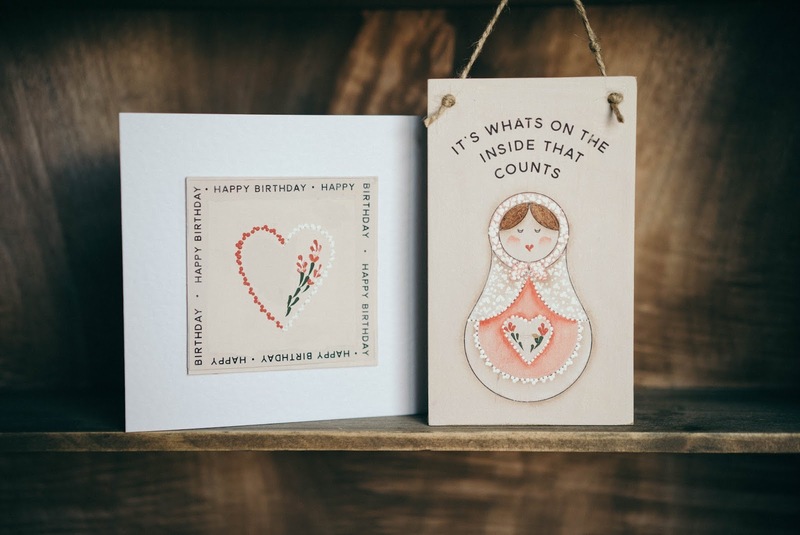 Despite the variations, one thing is certain, they have become a symbol of Russia, part of their culture and not only a popular item within Russian homes but in the homes of all those who have visited. Recently welcoming some Russian guests to Sheffield, I was honoured and touched when they gave me a set of Russian dolls. Both sets I own have been given to me by young people who were not aware of my love of Folk Art or my company. I love seeing these on my mantelpiece, not only because of the gorgeous handprinted decoration but because of the colours. First seen in Russia in the late 1800's, there are a few ideas regarding how they first came to be. It is thought that they were inspired by the nesting boxes of China and Japan. In Japan, nesting dolls were loved by many and consisted of 7 dolls, the largest made in the image of Fukurojuro, the Japanese god of happiness which opened to reveal 6 other lucky gods. Wanting to find a way to preserve Russian culture, Savva Mamontov opened a workshop with the sole purpose of creating childrens dolls to help illustrate different aspects of their culture. Part of the workshop group, Sergei Maliutin was inspired by the Japanese dolls. Pairing up with Vasiliy Zvyozdochkin, a wood turner, Maliutin began designing the decoration. Right from the beginning, the dolls were made to depict peasant women. Dressed in womens clothing, you will most likely see them with Babushkas or kerchiefs around their heads. 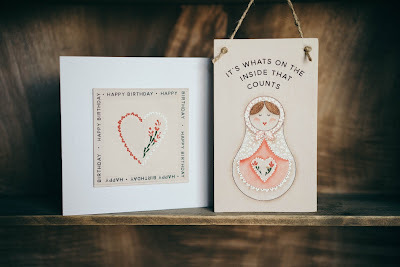 They have certainly become a symbol of family, of Motherhood and the strong female role within Russian culture often being referred to as Matryoshka (meaning little matron) dolls or Babushka (meaning Grandma) dolls. When we looked into the history of these dolls a bit further, we loved hearing that traditionally, making these sets would be a family affair. Beginning with the smallest doll, made out of a single piece of wood, the others would be carved or turned out of two pieces before being decorated by the whole family. They were traditionally painted to depict everyday life and so many were seen (much like the original set) holding items such as bread or flowers. Since then, their decoration has developed. Seen as a great educational tool and toy suitable for story telling, you can find dolls decorated to depict fairy tales and stories, animals or important figures in history. However, we have to admit that our favourite is still the more traditional design. we just had to include a babushka headscarf and apron. 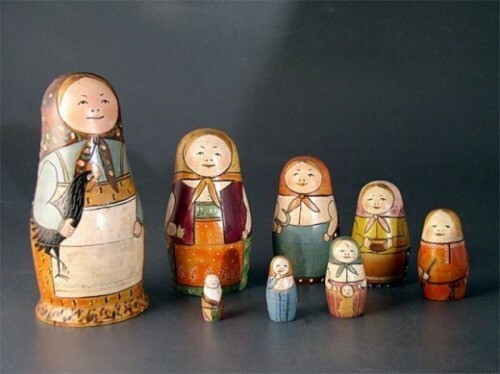 I liked the Russian Dolls before I even owned a set of my own but being presented with sets as gifts from young women made it clear just how successful Mamontov, Maliutin and Zvyozdochkin were in their vision to create something that would become an symbol of Russian culture. It is true that they hold a certain charm and beauty that communicates the importance of family, friendship and love and that message seems to have endeared itself to the hearts of many, in Russia and beyond. I know I will certainly treasure my own sets for many years to come. So you've got our kits but Valentine's Day is coming up (or some other special occasion) and you just don't want to paint any of the usual designs, you want to create something different, you want to try something new. Well, we may just have the thing for you. The great thing about Folk Art painting is that the same basic brushstrokes can be used in so many different ways, once you've learnt these brushstrokes, you can create something entirely new without learning any new techniques. 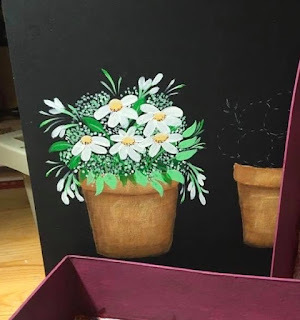 Here, we have used elements from our painting kits to design something a little more traditional, we hope you enjoy the tutorial. I began by creating a basic template for you to trace onto your card that you can find here. This is larger than the mountboard as I use a wooden heart as my template. Begin by transferring your design on to your card. We tried this design in a variety of colour ways - white on black, black on white, red on white and colour on white. The choice is yours, play with colour and see which you are drawn to the most. Speaking from experience, begin in the centre of the design and work outwards to prevent smudges! Using your round brush, fill the centre heart in the colour of your choice. 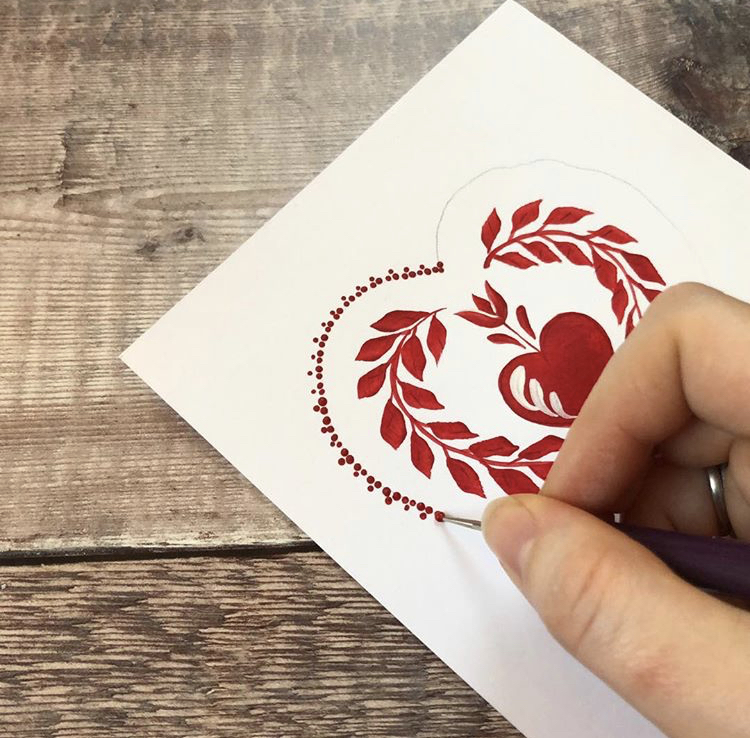 When it is dry, add three comma strokes down the right hand side of the heart using the liner brush. Paint your tulip using the round brush. Begin painting the centre comma stroke. For the side petals, flick the tip in the opposite direction. Optional: if you feel confident, side load your brush with a contrasting colour when painting your side petals. If you wish, add comma stroke leaves using your liner brush to complete the tulip. We did this for some versions we painted and not for others - play with your design and see what you prefer. Using your Flat Brush and the s stroke we teach in our Rosebuds kit, add leaves around the heart. Using the liner brush, add branches through the centre of the leaves. Using a contrasting colour, connect each leaf with smaller branches (see below). If you don't feel confident using your liner brush, draw the line using a Uni Posca Paint pen in a matching colour. Add two leaves at the bottom of the pattern. Using your Round brush, add bluebirds under the heart. Optional: tip the brush with your contrasting colour when painting the birds (something we teach in our Bluebirds kit). 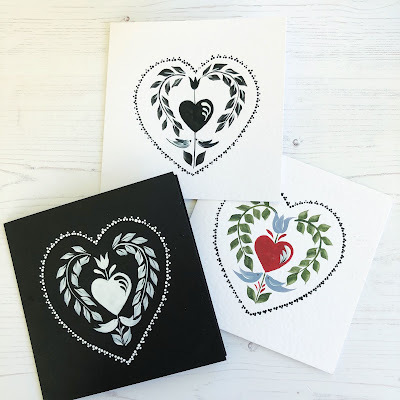 Using the small end of your dotting tool and your chosen colour, edge the larger heart with dots of paint. To do this, paint triangles of dots with the points facing outwards not inwards. Play with colour. We painted the design using white/black on black, black/white on white and also a colour version using the colours from our Round Brush Starter kit. As you can see, in some versions of the card, we have added dot daisies and details, in others, we have painted the main design only. The choice is yours, play with it and have fun! 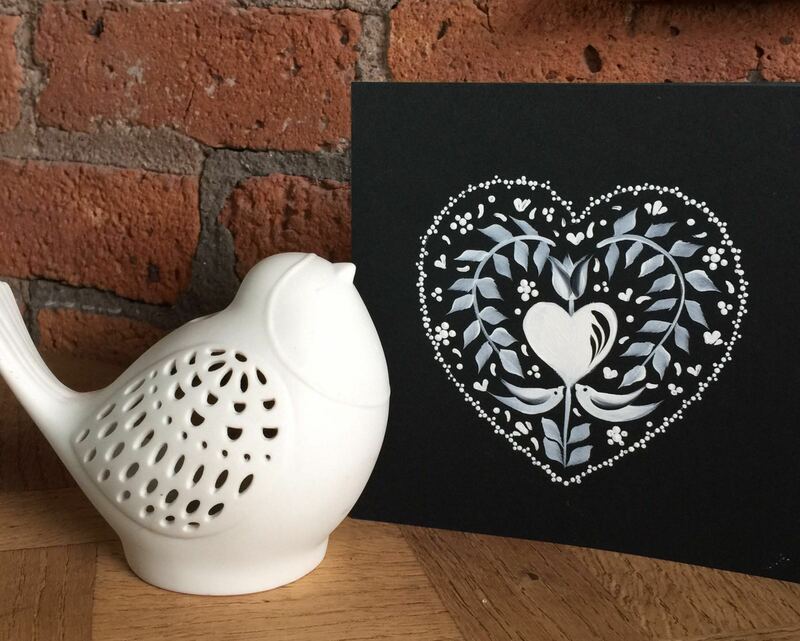 We hope you enjoy our take on a more traditional Folk Art design - perfect for Valentines Day. This month, our challenge has been to find inspiration in music. While we may turn up our favourite tunes in the studio while we paint, that is usually where our inspiration ends! We are pleased to say however, that our inspiration and yours has taken us by surprise. Pairing our painting kits with music has created a range of great ideas and we thought we'd round up a few for you. Musical notes - when you're practicing brushstrokes, it can be fun to create something new with them and play with ideas without committing too much time in case your idea doesn't work out. These daisy notes by In Blume are a lovely twist on our Daisy Details kit. 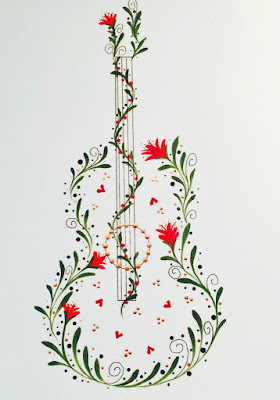 At the Painting Table has created this lovely card by painting a little music using her liner brush. 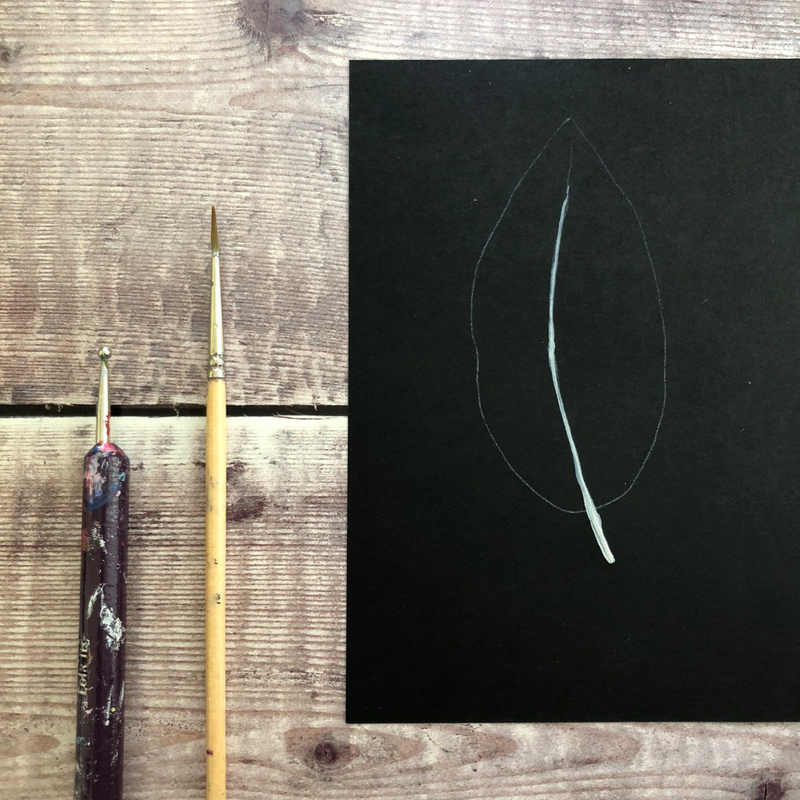 Painting with your liner brush is a little different to painting comma strokes but once you've mastered it, this brush is perfect for painting more delicate designs. Carol recently went to visit friends in South Africa and got creative with her friend Ronel. 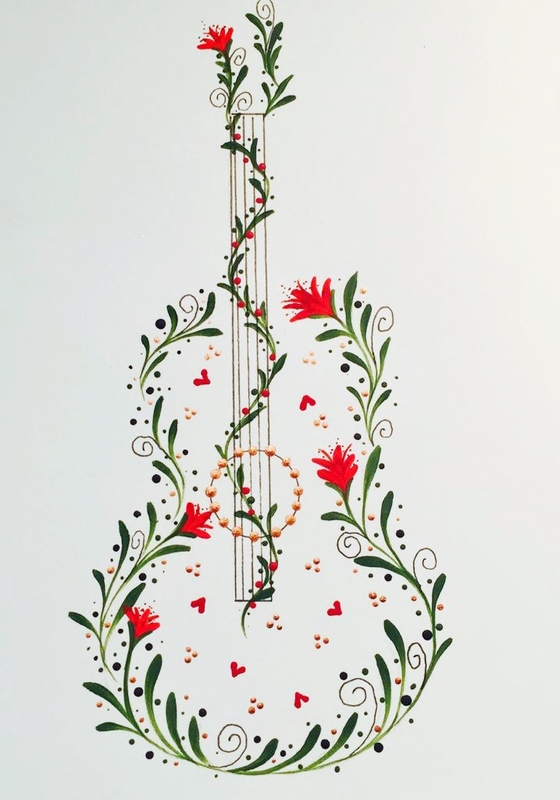 Armed with some free music sheet printables, she used them to create a border before adding some liner brush patterns and hearts. We think the black heart would make a great Valentines card for the music lover in your life. What do you think? 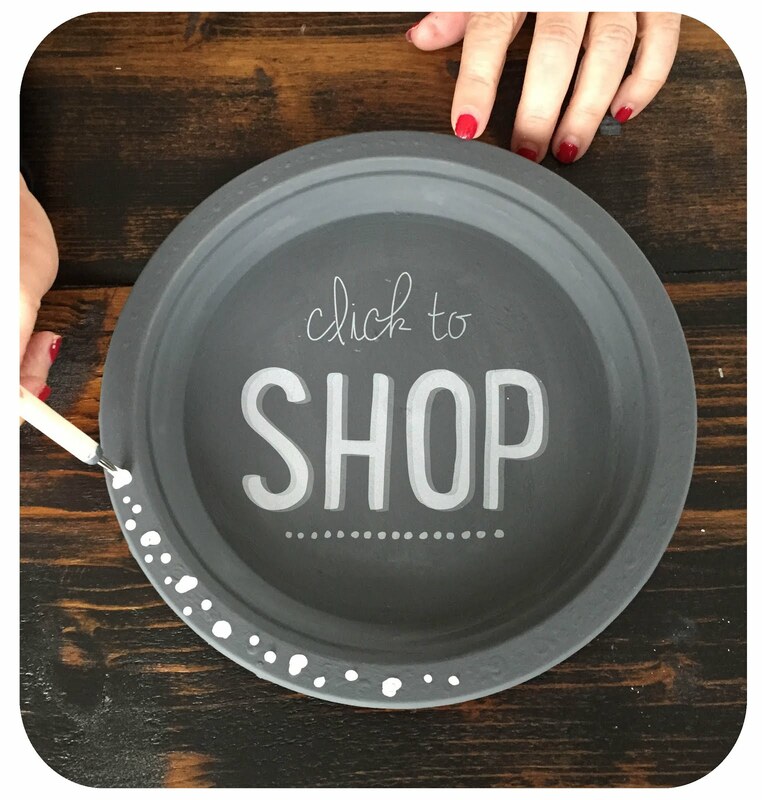 Take a silhouette and decorate it with a few liner brush strokes to create your own unique design. Sandra used a mixture of comma strokes, lines and dotting to create this pretty pattern. For the strings she used a Micron pen. If you don't feel comfortable using a liner brush for the longer lines and swirls, why not use pens or colouring pencils and just use the brush for the comma strokes? Get your hands on some old music sheets to create some Vintage vibes? Here we toned down the background (you don't want the music distracting from your painted design) using a little Antiquing. If you want to know more about how to do this, check out our You Tube tutorial. Use a little music to create a centrepiece and add a little lace around it. Learn to paint our delicate lace design using our kit and then follow our great tutorial to build on those skills and learn to create your own patterns. Jo from The Original Craft Co doesn't get much time to herself but inspired by this months theme, she knew the perfect project. Sitting unloved in a corner of her home, she dusted off her tired looking radio and gave it a new lease of life with our Vintage Roses kit. 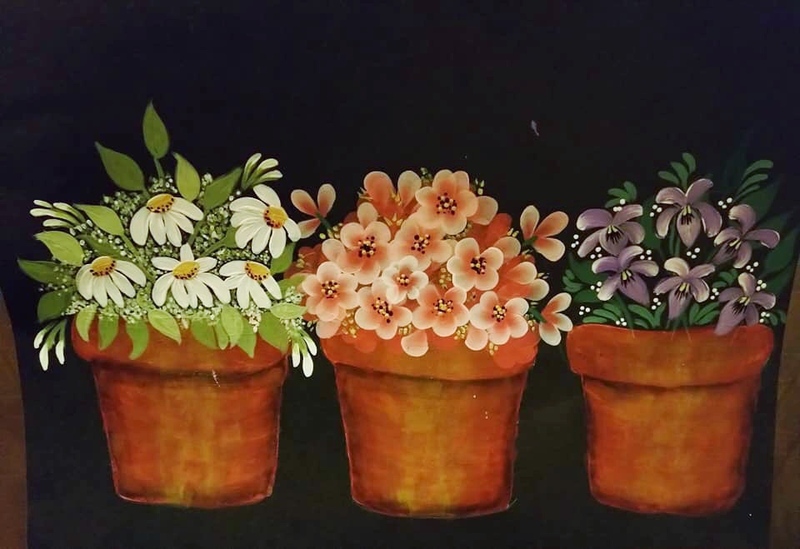 Inspired by a song, At the Painting Table searched for this pretty flower and used her Folk Art round brush skills to create a version of her own. Once you've learned the techniques from our kits, it just goes to show you can create and paint so much more. 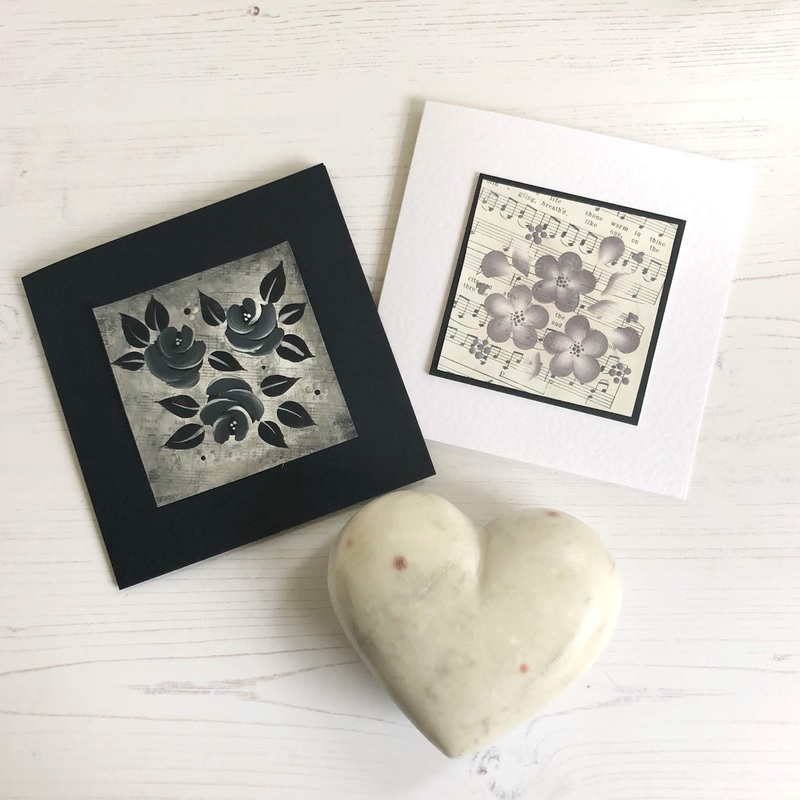 When we first came up with our monthly themes for our painting challenge, we thought it would give us a focus, a way to inspire us and we are so pleased that it has done that and so much more. Once again, we are blown away with all that you can do with a few brushstrokes. 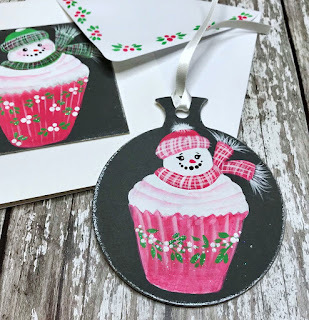 Step 1: transfer our Snowman cupcake pattern to your surface. This will fit perfectly on one of our square mount boards or baubles. Step 2: To help the colours on your final piece pop, base coat the entire area of your design with white using your flat brush. Step 3: Transfer the lines you need back onto the painted area. Step 4: Using your flat brush again, base coat the cupcake wrapper in red and the top of the snowman's hat using Green. Before base coating the rim of the hat and the scarf, add a little white to make it just slightly lighter. Step 5: Using the Razzle Berry, float colour onto the cupcake to add texture, just as you would in our cupcakes kit. Don't forget to add rosy cheeks too! Step 6: Using white, float colour around the base of his hat to highlight it. Step 9: Float white lines on the cupcake (as shown in our kit) and add berries to the area using the dotting tool. Step 10: Apply Crystal Glamour Dust to the design as you paint to create that all important sparkle at winter time. 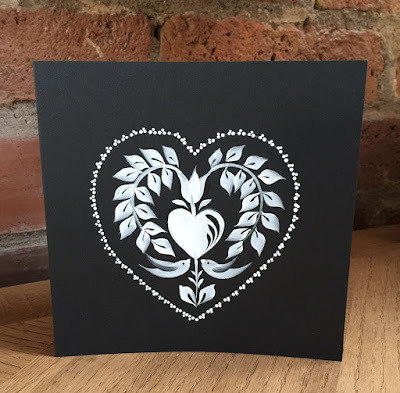 Don't fancy making a card? Why not try adding it to one of our baubles? Introducing our first Folky Weekend workshop! © You Can Folk It!. All rights reserved.